Does New Zealand need another “Qualmark”? It is good to see the interest in the 2012 tourism forecasts prepared for the Ministry of Business, Innovation and Employment by NZIER. Our forecasts are designed to promote debate and encourage strategic thinking from the industry so that they can continue to provide visitors to New Zealand with high-quality experiences, outstanding services, and the warm hospitality our country is renowned for. In the last issue of Inside Tourism, Covec’s Shane Vuletich raised some concerns about the accuracy of our forecasting. I would like to take this opportunity to clear up a few possible misconceptions. What are the forecasts for? Our forecasts are mid-range – looking five years into the future – and are aimed at providing insight into tourism trends. This is information that both industry and other government departments can use in developing longer-term strategy and policy. It is important to remember that the forecasts are not a consensus view and should not be seen as strategic goals. They offer a baseline estimate of what will happen if there are no changes to the status quo. If we forecast a market is declining, it is far from the final word. The information can be a useful tool to industry to point out where things seem to be heading and allow them to take appropriate action – perhaps to invest in reviving a market or exiting it for other opportunities. Why are they based on estimates of economic demand? For industry wanting a prediction of what will happen next season, those with knowledge about the supply side (for example, advance booking or plans for changing air routes) will be able to give the best estimates. Once we get two years out it is the level of demand that becomes important for forecasting. NZIER tested the demand-led econometric method we have adopted by applying it to past years’ data. The results showed that once the period was two years out this method was closer to reality than simpler methods or the historical published forecasts. If demand is there, airlines will adjust flights to meet it. This was highlighted last year when Chinese visitor numbers actually exceeded our forecasts (which had been seen as ambitious by some in the industry). Airlines put on the necessary capacity to meet the demand. Fundamentally, demand will be the result of international economic factors that are out of New Zealand’s control. This is why we now take the best data from a range of international groups and agencies on economic and demographic trends. While the old approach to forecasting largely relied on input from the New Zealand tourism industry, we now get a much wider picture of what is happening globally to give us a better understanding how economic factors in our foreign markets affect tourism numbers here. Could the method be improved? We welcome a debate on forecast methods but while we have heard a number of criticisms second hand – such as the piece in last week’s Inside Tourism – it has been disappointing that there has been no real engagement with the technical issues of improving the forecast methodology. We’re very open to improving the method. For example, we are investigating whether more reliable forecasts of Chinese spend in New Zealand might be obtained by removing a data spike in the early 2000s caused by one-off changes in the numbers of Chinese students studying here. This spike makes forward projections difficult. We have our experts working on this highly technical problem and are more than prepared to engage on this – or any other technical issues – with others. Why aren’t the expectations of the tourism industry used to moderate the forecasts? MBIE’s current methodology is based on “what the data tells us” – what will happen if current trends continue and international economic variables play out as forecast. As I’ve said, previous forecasting methods tried to use industry knowledge of immediate pressures, trends and changes in supply (eg air routes). The results weren’t always as good as might be hoped. Consider the graph below, which shows the industry moderated forecasts being optimistic, year after year, about arrivals from the UK. This method, which was used prior to 2011, gave undue weight to industry expectations that the market would recover. As the actual figures show, the whole time the market was in steady decline. In 2011 the then Ministry of Economic Development (now part of MBIE) used a data-based model for forecasting and for the first time predicted a continuation of the decline – though much slower than has actually happened. MBIE’s 2012 forecasts for the UK suggests the decline is slowing. The point is that, regardless of optimistic forecasts, the market has declined significantly. We have attracted criticism that our forecasts have had a negative impact on the industry (ie. making it more difficult for some tourism businesses to gain credit) but we believe it is best for businesses to know what is happening rather than over-invest in the wrong markets and go into more debt. In the long run we believe it is better for everyone to know what is really happening so they can plan accordingly. No forecasts will be “right” and we think it is misguided to criticise forecasts as “inaccurate” as though they were estimates of actual historical spend or tourist arrivals. 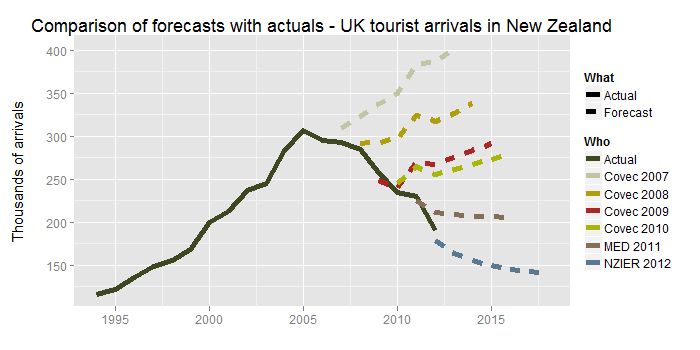 One important development of the latest (2012) forecast is that clear margins of error have been introduced – a long overdue innovation in New Zealand’s tourism forecasting which brings us up to standard international practice. The Ministry would welcome other parties preparing tourism forecasts. In other important economic areas, it is accepted that different banks, consultancies and academics put forward rival forecasting models and there is a continuous competition of results and techniques. Research into the tourism sector has suffered through a lack of such high quality competition of ideas. The debate on the forecasts is welcome because it has drawn attention to significant structural change happening to New Zealand’s tourism markets. The industry needs that debate about the substantive issues. The Ministry is also happy to engage in discussions on forecast methodology but it needs to be evidence-based, incorporate forecasting good practice; and most importantly, not distract from the more essential task of dealing with what the data is telling us. In the past six months MBIE has stepped up its engagement with the industry on data issues as part of the Tourism Data Improvement Programme. A Tourism Data Industry Reference Group has been established for high level engagement, and monthly tourism data seminars are organised jointly with Tourism New Zealand and the Tourism Industry Association. Note – NZIER were selected to undertake the forecasts by a competitive tender that attracted many high quality proposals; none of the bids proposed using the method that had been used up to 2010.